parks, and lots of shopping streets. I wore this outfit when I went outto dinner and things last night. This striped top is one of my Topshop purchases. I love the classic look that stripes can bring to almost any outfit. changed to Bloomsbury. I think I'm quite happy about this change though. recommendations for things to do in the area? You look great, stripes are always good! I'm so jealous that you're moving to London, but one of my best friends will spend this semestre there, and I will definitally visit her there soon! bonnie, so glad to hear you are having an amazing time over there. im enjoying all your pretty pictures! Awwwwwww I'm so jealous now!!!! Hope everything will be great in London! Love your bag, and striped tops are always classy! Wish I lived in London to be honest, it kind of seems like it's where everything is going on, you know? wow, you are picturesque of typical american consumerism. Oooooo anonymous was trying to come out and hurt you but unfortunately garbled the use of "picturesque". PAH! Don't take it seriously, Bonnie. Haha! thanks ana you're so sweet! :) silly anons. Very nice outfit!! I love this kind of jackets that you are wearing but somehow they don´t fit me well. I love that your bag is almost the exact same length as your skirt. Picturesque, graphic, vivid - apply to descriptions that produce a strong, especially a visual, impression. Picturesque is a less precise term than the other two. Hi, annonymous? Have you noticed I never respond to you? This is the first and last time I'm going to, so you can stop whenever. Urban perfection. This outfit is killer! And please don't mind the stupid anonymous losers. I can't stand them. You are amazing. Period. dublin artcutexture looks like so amazing and beautiful. and your outfit is very cute. i love striped tees too! i love all your outfits - perfect mix of classy and quirky! Love you blazer. You always look so amazing! I really like the oversized blazer, and you can never go wrong with skinny stripes. The whole city looks so cool. That red door is pretty epic. Teah, have fun on your trip! 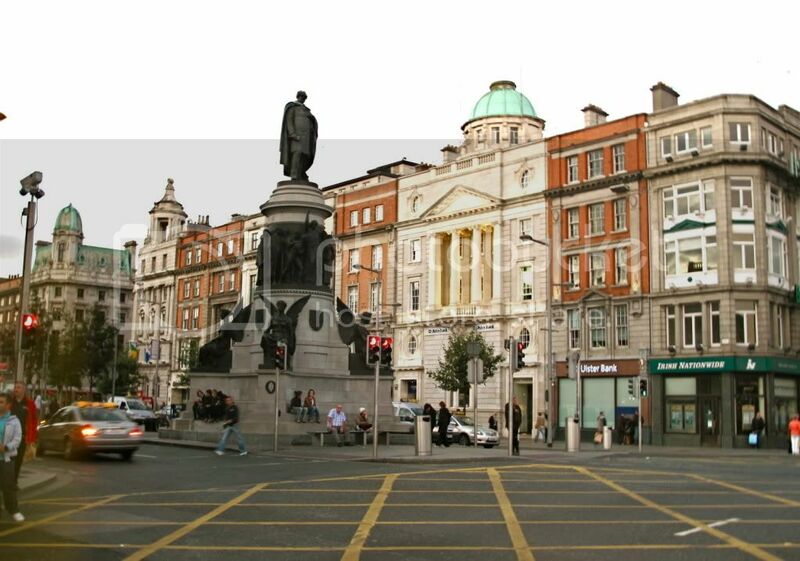 I need to go to Dublin again, haven't been since i was 12 or something! really like the blazer too. lovelovelove your outfit. Those wedges are amazing. Wow, 15 minutes away from Oxford Circus? I'm jealous.. Love your outfit, think you inspired me to wear one of my striped shirts today..
Oh I'm sure you'll love London immensely! Oh I just love stripy tops they look so classic and nautical. you are too cute. I love the wedges from h&m I am quite loyal to my pair as well! you wear them cuter. You're in London? I live in London yet I'm at loss to recommend you..
Go to Brick Lane for the vintage shops and market, and theres a great photo/art thing I'm going to go to, advertised as "Born to Rank"
"Rankin" etc. You can't miss it. oooo exciting! i love, love, love your blazer. and i'm addicted to stripes as well. nice outfit! cute purse and love the wedge shoes! Nice jacket! you look fabulous!! love that blazer! you have amazing taste. Love your blazer and that bag looks wonderful. YUM at the Starmix :) Hope you're having a lovely weekend dear. Oh and Bloomsbury should be fuuuun, you'll be right in the middle of everything! This is a perfect casual chic outfit!! I love your striped tee! It can be styled with everything!! love the shoes and the skirt! really cute. i'm excited for the pictures of the castles. i hope you had a fantastic time! ahhhh! 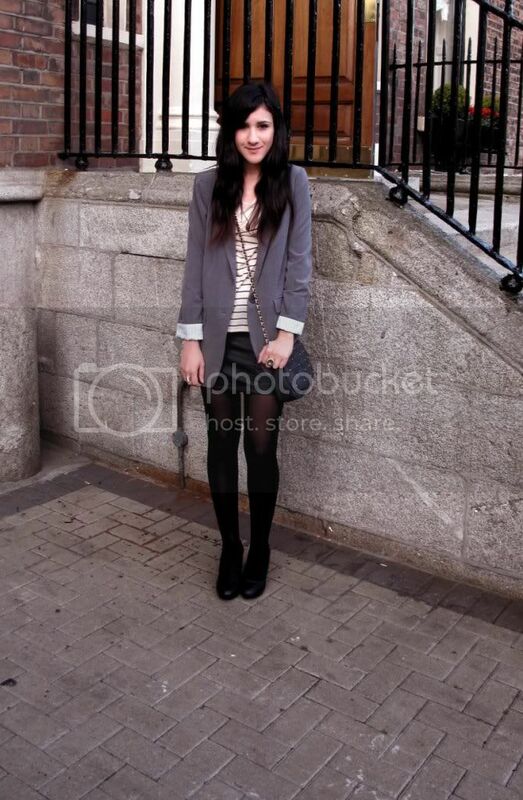 great outfit once again:) i lvoe the greey blazer, the fit on you is perfection! I cannot recommend any place around Bloomsbury (I don't even know where that is) but you def have to go to Brick Lane, specially on a Sunday it's the best day! I just hyped that look on lookbook! And you must be having so much fun there now. Those wedges are just a perfect touch to this outfit. And gummi bears,my fave !! wow! love the outfit! i can't wait to see more pics of your trip!! You are walking the streets & castles looking uber stylish! great blazer, looks like you've found the perfect fit! Yeah Bonnie!!! U made it congrats!!! The pictures are lovely and the outfit too. beautiful shots! I love the purse! sounds so wonderful! have fun in London! love your shoes! Can't wait to see castle pictures! I love the fit of your blazer. you look stunning, and glad you had such a great time. have fun in London! there's plenty around Bloomsbury especially if you like pubbing. and then there's the umbrella shop on oxford street which is a must. I love everything about your outfit!!! The striped top, the black tights, the grey blazer, and the leather skirt!!! So simple and effortless. You look amazing! That is real cool, are you traveling with your friends? family? i am so jealous of where u r right now! but you are dressing fabulously and your pics are great! what a great outfit, i LOVE your blazer!! Awesome outfit but love that blazer especially. You look like a London girl. I would like to have everything you wear!